Give registered members a voice. This simple online forum can be used by members of an organization, prospective customers who complete a registration process, or any other group the site's owner wants to specify. A simple form makes it easy for users to post comments, either responding to previous posts, or starting a new discussion thread. Comments are organized by topic and posting date. Registered users can post and comment on others' postings. Users can create new categories. Optional client-reply feature gives affiliates, advertisers, etc., the ability to comment on customer postings. 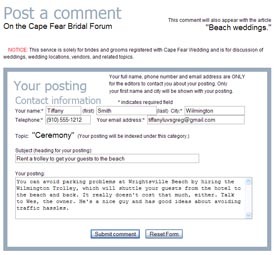 The default is to make the forum visible to all site visitors, but allow only registered users to post comments. For purely internal communication among a group's members, the entire forum can be made private, accessible only with a username-and-password log-in. Comments can be posted in reply to previous threads, or users can create a new topic. A free user forum, on a subject of interest to a target audience, is another way to encourage repeat site visitors and customer registrations. Membership groups can offer this feature as a perk for joining online. 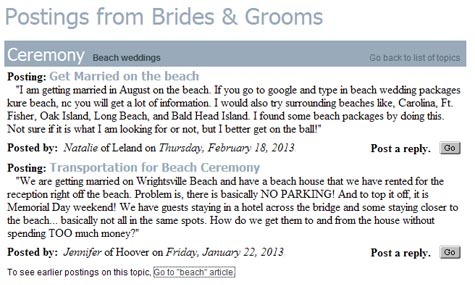 An example of forum postings by registered users, in this case brides-to-be.